With an Extended Warranty* from Chippers Direct, you can add 1 or 2 additional years of warranty coverage for your new wood chipper. These Extended Service Plans provide your new chipper shredder with the best protection against any potential failures. These plans cover the replacement of new chippers with a purchase price of $400 or less. The product replacement plan becomes active once the manufacturer’s warranty expires. Repair plans cover the full cost of needed repairs of for new wood chippers with a purchase price more than $400. Repair plans activate following the expiration of the manufacturer’s warranty, but generally cover repairs throughout the duration of the contract. For products that are difficult to transport, choose an On-Site Repair Plan, allowing your product to be serviced from your home or business. For chipper shredders that can be dropped off at an authorized service center, choose the Shop Repair Plan. 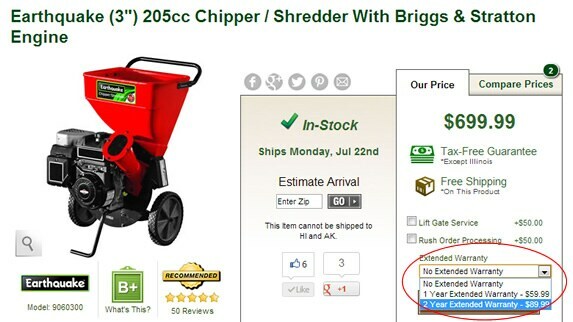 Wood Chipper Extended Warranties - Find Out How To Get An Extended Warranty On Your Chipper Shredder. Our chipper shredder how-to library can help you pick the perfect electric chipper shredder, gas chipper shredder, pto chipper shredder or chipper shredder vacuum.